What is the purpose of spiritual enlightenment? Is enlightenment the end of the road for a seeker? Does an enlightened person not gain any further knowledge or experience? Can you be spiritually enlightened, then lose it? Do spiritually enlightened people have different kinds of brain activity? Which texts do you read for your kundalini awakening? What is meant by surrender in spirituality? Why is Namasmarana (remembering the name of Lord) given a lot of importance in Kalyuga? What is Meditation? Is it an emptying of the Mind? Can one really do that? Is the emptiness of the mind the destination of meditation? Virtues - Gratitude, Forgiveness, etc. What do you think is your most important human virtue? Is forgiveness a sign of cowardice? What are your top 5 favorite spiritual quotes and why? What are some best quotes regarding Spiritual enlightenment? What's your favorite spiritual ocean quote or metaphor? What is your favorite spiritual anecdote? What are some good books for spiritual enlightenment? What are some books to read for self-realisation? Do spirituality and science go hand in hand? Reincarnation: Can humans ever be born again? Is it possible to know about the previous life by any yoga? How? How can I know who I was in my past life? Why does some place that I visit the first time seem extremely familiar? Is it just coincidence or could it be spiritual? What would be some prayers/mantras in Hinduism or Buddhism for wishing good health on someone else? What are some of the greatest examples of presence of mind? In spirituality, there are 100s of questions (e.g. Why was this Universe created?, When did Karma begin?, Why is there evil in this world?, etc., etc.) for which answers do not exist. They are called transcendental questions and Mahans have instructed that one shall not strive to dwell upon these sort of metaphysical questions but instead devote all the time spent in musing (for answers to these questions) to know oneself - i.e. to realise who one is, in reality - i.e. to attain self-realisation. Mahans have told that you will not find answers to these questions even if you rack your brain for millions of years. Please read answers to the questions numbered 78, 81, 120, 23 in the free book (May I Answer? - Swami Sri Sivananda.pdf) you can download from here - http://www.dlshq.org/faq.htm - where it is made crystal clear why we should never ever dwell upon transcendental questions. For those curious, question no. 78 goes like is: "I would like to know why we are all created and put to this miserable and pitiable plight. You would argue that we are never created and never would die. Then why should not we all be in that all-pure, omnipotent state without being entangled by Samskaras and Maya?" I love the 'Clock Analogy' given here - Should-it-be-Bhakti-Jnana-or-Karma-for-me - and strive to act as per it, as much as possible. i.e. keep ticking on with your work - tick tick tick tick tick tick (like the second hand of a clock which is usually hardly noticed and not given much importance) - so that the minute hand (Bakthi) moves after a while, which results after quite a long while in the movement of the hour hand (Atma Viswaasam - Self-Confidence), and thus ultimately leading to SELF-REALISATION, the one and only goal of human life, as stated innumerable times by the Mahans. 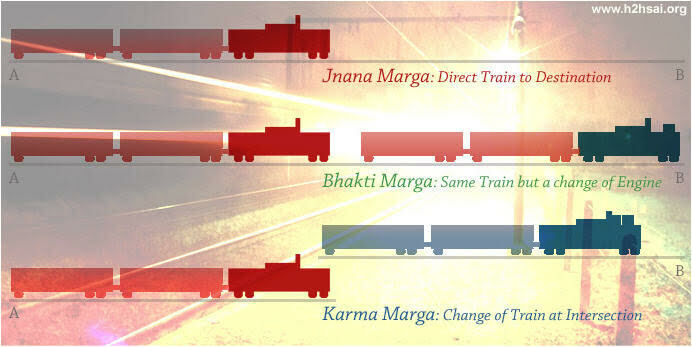 The 'Train Analogy' given here - http://media.radiosai.org/journals/Vol_08/01FEB10/01-conversations.htm - illustrates the 3 paths so so so beautifully. I have realised that the 'Clock Analogy' referred by me in the previous section shows the way to adopt for NOTHING entities like me, until my SatGuru (my own SatGuru; எனக்கே எனக்கான சத்குரு) arrives in my life and guides me uninterruptedly towards Self-Realisation, which is the one and only goal of life (as repeatedly said by the Mahans, countless times). Thanks a ton to RadioSai.org for the above image.